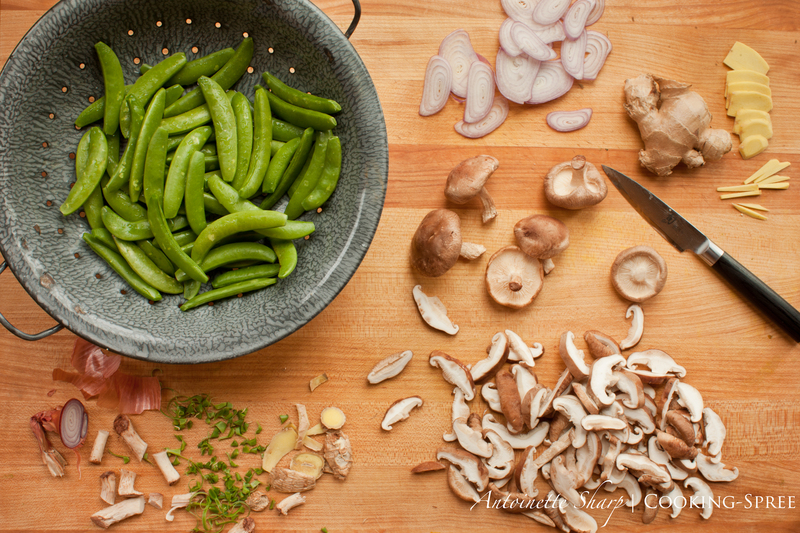 A very little time spent prepping the vegetables the night before will make this dish a breeze. Wash the snap peas and remove their strings, if any. Put a pot on to boil, add salt. Have a colander in the sink and a bowl of ice-water close by. When the water comes to a boil, add peas. Cook for only 1½ to 2 minutes. (You want peas to be bright green and crispy, nearly tender.) Empty into colander. Transfer peas to bowl of ice water for one or two minutes to cool. Remove from water. Place in a clean kitchen towel, and roll and pat to dry. (At this point you can put them in a plastic bag and put in the refrigerator if you’re preparing ahead.) Otherwise set aside as you prepare the other ingredients. Remove the stems from the mushrooms and slice fairly thinly. Cut the ginger into tiny “matchsticks”. (Whether you opt for 1 or 2 tablespoons is entirely dependent on your love and tolerance of spicy warm ginger.) Thinly slice the shallots. Heat the canola and sesame oils in a good-size skillet over medium heat. When oil is shimmering, add the shallots and, stirring constantly, cook for 1 to 2 minutes. Add the ginger. Stirring constantly, cook about 30 seconds, then add mushrooms, and cook for 2 to 3 minutes longer. They’ll have begun to release some of their liquid and have started to sizzle. Raise heat to medium-high and add the peas. Stir occasionally, allowing peas to be touched by bits of brown. Add the soy sauce and cooking sherry, deglazing the pan of brown bits. (Taste for salt, adding a bit more soy if needed.) 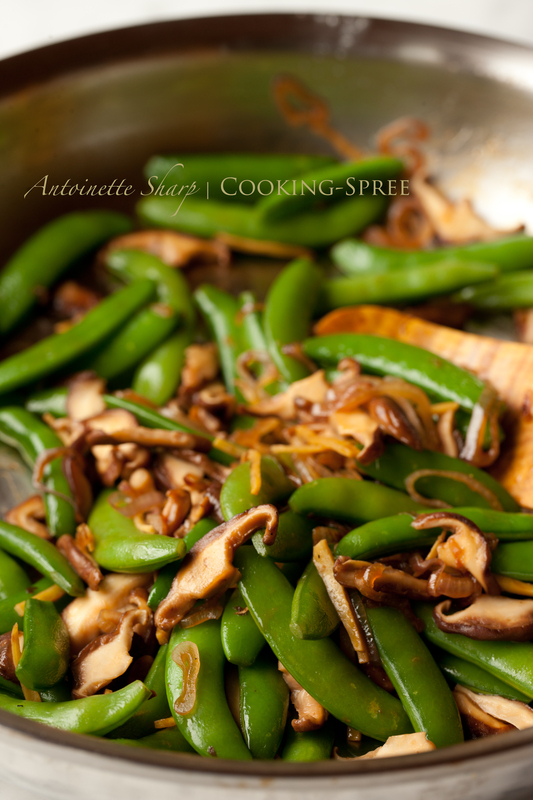 Add a pat of butter, stir to melt and glisten the peas and mushrooms. Serve. Printer-friendly version of the sugar snap peas, click here. Bring water to boil, add salt, butter and bouillon (if using.) Add rice, stir, return to boil, then lower temperature to simmer. Cook on simmer for 30-35 minutes. (My simmer took 35.) Turn the heat off and allow pan to sit for 5 minutes or so before removing the lid. Fluff rice with a fork. Return the lid if not serving immediately. Before serving sprinkle with chopped chives. Printer-friendly version of the rice, click here. The very last thing you’ll do with this dinner is to prepare the ahi. It will only take several minutes, and both the rice and the vegetable can hold on a wee bit as you sear it. If you can allow your ahi to sit on the counter for 20 minutes before cooking, some of the chill will have come off it. Since we’ll be cooking it rare, this will be a good thing. At this time, it would be good to prepare the condiments – soy sauce in a little dish if you can, pickled ginger and wasabi paste in the corner of the plate. When your skillet is smoking hot, drop the ahi (lovingly) into the pan. Watch it closely. Ahi is the most exquisitely tender, delicate fish. You could be toothless and eat it happily. It NEEDS to be rare. This means very pink, which is really more like a claret. (When you buy sushi grade ahi, it’s selected to be eaten raw, and you could certainly do that, but we’ll save that for another time.) Watching the sides of it closely, you’ll see the bottom edge begin to turn white. Allow that white to travel up just a fraction of an inch. I’d say whatever you’re comfortable with, but then you might miss the best fish your mouth has ever known. You can judge from the photo what’s about right. Flip when ready, and observe the same careful watch for the other side. Remove from heat. Slice on a diagonal, not following the natural “seams” of the fish but running diagonally counter to them. Plate the rest of your dinner. Serve! 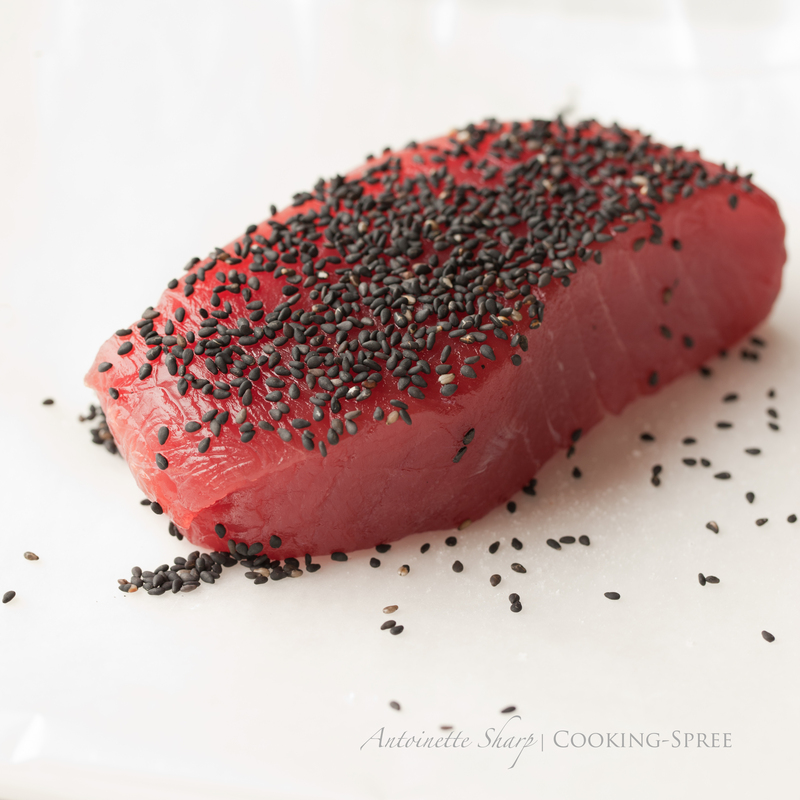 To print the Ahi recipe, click here. You have really outdone yourself. Some year, I’m going to prepare this meal for my lovah. What a feast for every sense, I imagine. And beyond gorgeous. There really are no words. Really, it does not look hard. ‘Tis about sharing an evening with young ones and not just my love. 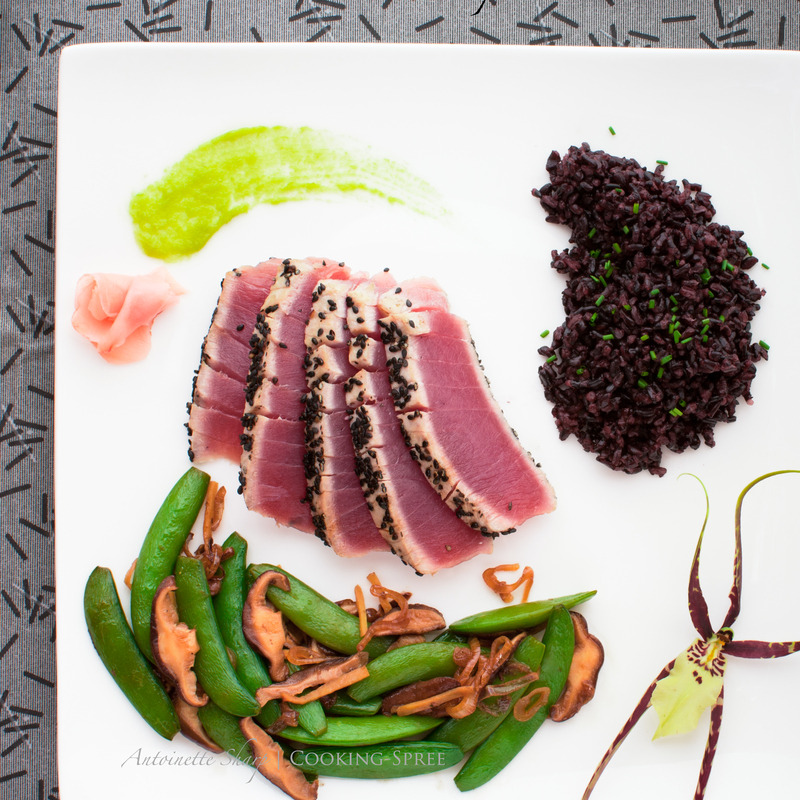 I think forbidden rice and ahi might not be fully appreciated by those wee ones. Looks fun and beautiful! I do believe you’re right on the ahi…but the rice? Little girls not liking purple rice? they could even decorate the plate with pansies, a dinner fit for fairies! You’ve got yourself a great point there! May I sing the praises of my Valentine? Cad that I am, I have business that requires me to be absent for the Hallmark holiday of passion. Thus my incredible partner not only crafted this beautiful piece of work to share with you, her friends, but she gifted me with this oh so sensuous, beautiful and delectable work of performance art, while recognizing my pending abandonment. I can only assure you of the sincerity and total commitment Spree has made to share her innate heartfelt passion for life, beauty and sustenance that she brings to this space, and every space she inhabits. The cocktail is really a very nice start of sweetness and heat. That appetizer is really wonderful. You can see that it’s truly beautiful but it’s delicate, clean and subtle tasting, oh so luxurious without being gratuitous. The ingredients speak for themselves, simply elegant – and the preparation presents them respectfully and beautifully. 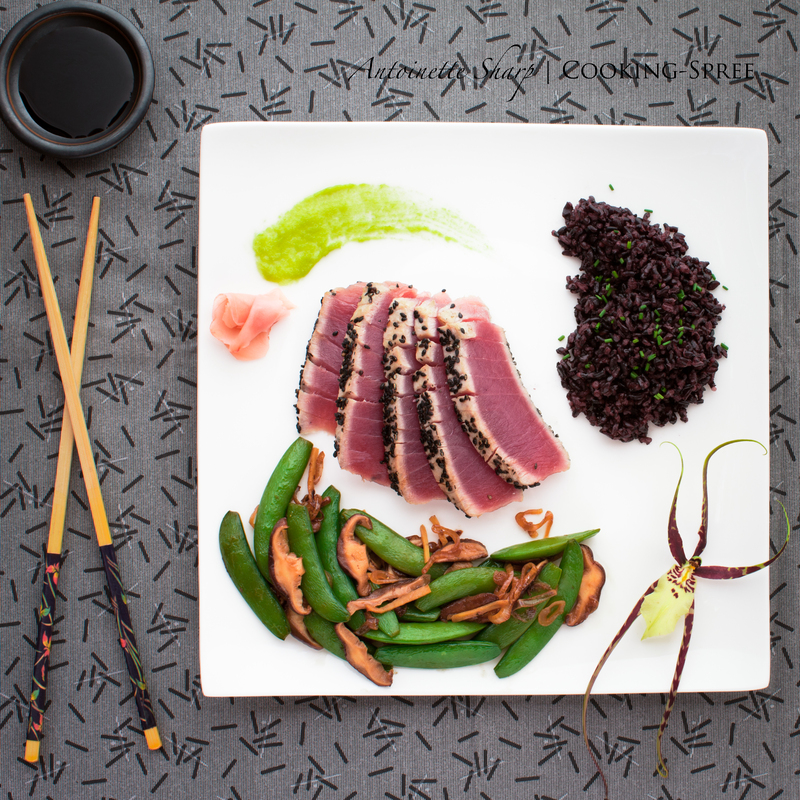 We simpy love ahi and this preparation is simple but so appropriate. A little soy/tamari and wasabi and the rodent’s eyes roll back into my skull in utter euphoria. Spree knows the portly rodent has a fungi fetish so that vegetable preparation speaks L-O-V-E to this furry nuisance. The forbidden rice is dramatic and offers a nice textural compliment to the rest of the plate. You all should be as blessed as I am to share this and so much more with my Valentine. I wish you all blessings as abundant as mine. This menu and my life with Spree is 5+++++++ on the portly rodent scale. Simply exquisite!! Beautiful in every way!!! Thank you Ali, so much! I made the snap peas last night! Fast and fabulous!!!!! I have to agree with Ali, this is wonderful. Really wonderful. I appreciate the kind words Nick. That is one gorgeous plate of food, Spree! Each component was selected and cooked to perfection. And I do not see how that tuna could be seared any more expertly. You’ve certainly prepared a meal to remember. Cannot wait to see dessert! So sorry to have made you wait for dessert John! Yesterday took me in another (still delicious) direction. 🙂 Dessert will be served shortly. Thanks so much (always!) for your (always) thoughtful comments! Love the pictures. Especially the one with the tuna and sesame seeds! So delicious. I love everything about your dinner, the ingredients, the plating is like something out of a 5 star restaurant and the colors work beautifully together. That’s awfully kind Sawsan. maybe a couple of stars. 😉 Thank you though! You have surpassed your self if that is at all possible! What fab photos, you do put your heart and soul in this, wonderful…. Lesley, Thank You! My heart’s in it for sure! My valentine sure did receive it happily! I’ve always said that the most difficult photos are the ones with food, and you’ve done an amazing job! It doesn’t look too difficult to make, maybe I should give it a try soon. What a high compliment Pablo, thank you so much! This is not quite (but nearly) ridiculously-easy to make! It it appeals to you, I hope you’ll give it a go! 🙂 Happy you came by to visit! And I’m happy to be a new follower of yours! You know that Miss Natterer here is rarely at a loss for words, but I confess that the combination of this menu (*every* spectacular and splendid element of it) with your preparatory directions, your descriptive paeans to the whys and hows and wherefores culminating in death-defyingly delicious recipes, and the glamorous presentation and photography–all leave me suspended in near-speechless rapture. And hunger/thirst, of course, let’s be honest. Topping all of that with not just a multiplicity of dessert treats but such delightful love letters to each other, well, you’ve really gone over the top in the most magical, irresponsibly tempting, and delightful of ways. Love it all. Love being privy to this sort of luxurious art!